Smalley Spirolox Retaining Ring and Constant Section Ring applications, although diverse, can be analyzed with a straight forward set of design calculations. There are four main areas that should be considered in most applications. Smalley Application Engineers are available to provide immediate technical assistance. The following pages of Spirolox Retaining Ring and Constant Section Ring engineering design have been developed from over 50 years of extensive testing and research into the various applications of retaining rings. The formulas are provided for the preliminary analysis of a ring application and the design of a Smalley® Retaining Ring. Design engineers commonly associate the word retaining ring to a basic style or type of retaining device. 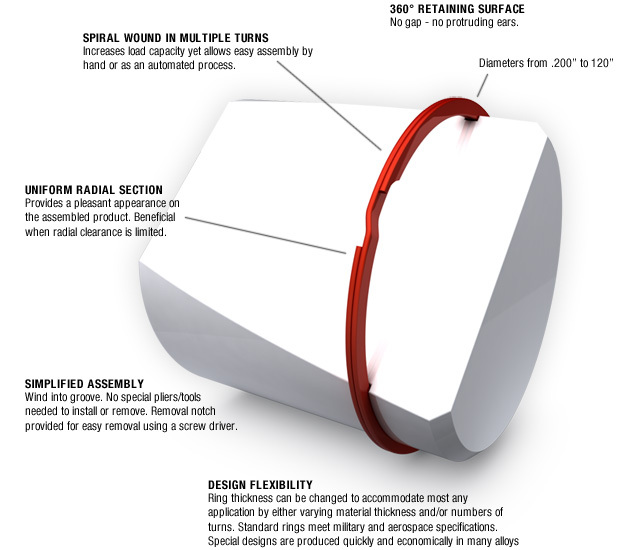 In reality, retaining rings are nearly as diverse as their applications. Smalley Spirolox Retaining Rings offer a distinct alternative and in many instances an advantage over the more common retaining rings available on the market today.